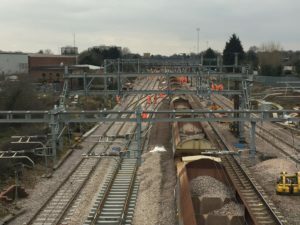 Network Rail is starting work to rebuild Walsalls Park Street bridge as part of the electrification of 15 miles of the Chase Line. The bridge has to be rebuilt in order to create enough room for overhead electric power lines. An electrified line will provide a more economic, environmentally friendly and reliable service. The bridge is in the town centre, so works have been planned in cooperation with Walsall Council and orchestrated to create as little disruption for traffic, pedestrians and nearby businesses as possible. It will happen in three stages, with only one side of the street closed at a time. It will pause in November and begin again in January 2016, to be completed by Easter, 2016. The work was delayed after engineers discovered that the bridge, built in the 1930s, did not adhere to the original plans, which affected the logistics of the project. Electrification provides a greener, faster and more reliable railway, providing a better service to passengers in Walsall and across the wider West Midlands. A significant amount of work is required to upgrade the railway and much is already under way or completed as part of our investment. Replacing this bridge is essential to allow the line to be electrified and while there will be some disruption when the work takes place, we have done all we can to keep it to a minimum. Id like to thank local people and traders for their patience. 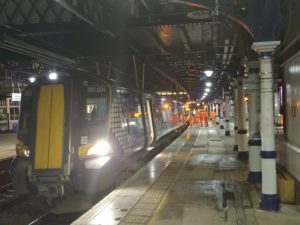 The electrification of the line is expected to be completed by the end of 2017.